Kalinka is a showy little bird with an eye for neatness, but her grumpy and messy monster neighbor Grakkle doesn’t care one bit about cleaning. Will an unfortunate turn of events bring a restless but well-intentioned troublemaker and a grouchy furball into the most unlikely of friends? With popular author and illustrator Julie Paschkis's brightly colored illustrations and signature folk art-inspired patterns scattered throughout, this whimsical and humorous tale will catch the eyes and warm the hearts of children and adults alike. We all have a little bit of Kalinka or Grakkle in us from time to time, and it’s important to know we’ll have a friend who will love us for who we are, even when we make a big mess! Featuring themes of friendship and compromise, Kalinka and Grakkle shows readers that even the most paradoxical of pairs can overcome their problems and still be friends. 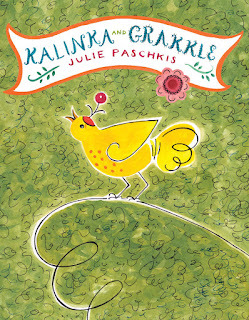 Learn more about the creation of Kalinka and Grakkle from the author-illustrator herself, and check out Julie Paschkis's blog post. Don't miss the 4-stop blog tour for Kalinka and Grakkle April 2-6! Get your copy of Kalinka and Grakkle at your local library, indie bookstore, or Barnes & Noble April 1!